Planting trees around rivers could reduce the height of flooding in towns by up to 20%, new research suggests. The report - from the universities of Birmingham and Southampton - says that with increased building on flood plains and climate change increasing the risk of heavy rain, many places can't be completely protected by walls of concrete. There has been a rush of interest in natural methods - planting trees and creating leaky dams which attempt to delay the flow of water by creating mini-floods upstream. But the report's authors suggest that most successful natural methods are likely to be on a much larger scale than currently in operation. They advise a strategic approach - taking a tributary stream to a main river then foresting the area round it, allowing the stream to make its own meanders, and letting dead wood from the forest to block the stream where it will. 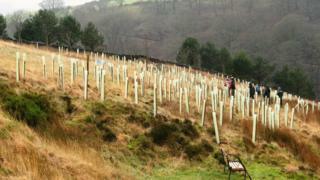 Proponents of "re-wilding" suggest turning a whole catchment to forests. But the authors say this would not work because all the water would be released at the same time. Simon Dixon from Birmingham University Institute for Forest Research told BBC News: "Where its possible to do more extensive planting than we're doing we really need to do it. It's a bit of a no-brainer." Ben Lukey, a flood risk manager for the Environment Agency, said there were insufficient funds to attempt the scale of works proposed in this report, although recent changes in grants might help. "What's identified is opportunity for bigger impact with more strategic catchment but we have to be mindful of the possibility that if it's not done well it could make matters worse. "To make the scale of changes to help a big city like Leeds for Manchester - that's a scale of ambition that would take sometime to come to pass." Floods minister Rory Stewart said the government was spending more than ever to protect communities and tree planting had a role to play along with improved defences and dredging.